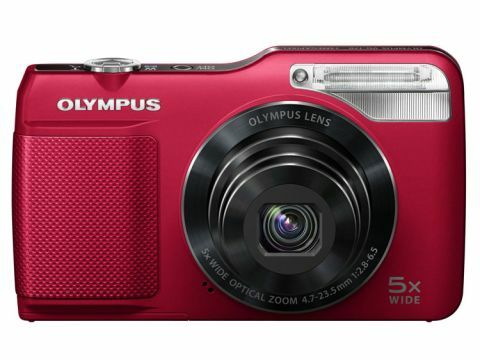 The new Olympus VG-170 packs a host of features into an affordable, compact camera body. With a recommended UK price of £100 and available to buy for just £80 if you shop around, this camera falls firmly into budget compact territory - but comes with many more premium functions. These include the ability to take 3D photos and HD videos, plus a 5x optical zoom that starts from a usefully wide 26mm. Olympus is marketing the VG-170 as a small and simple point and shoot camera for novice photographers, and its price puts it at the same sort of level as rivals such as the Nikon Coolpix S6200, Nikon Coolpix S3100, Samsung MV800 and Canon PowerShot SX150 IS. But the Olympus VG-170 has a standout feature: a flash that's around twice as powerful as most rivals' units. The company claims that in long flash mode you can even light up objects 15m away from the camera. This 14 megapixel camera also boasts a 3-inch 460,000 dot LCD screen, a textured finger grip on the front and a retro, if slightly plain, design. Other features include an intelligent auto mode, face detection, 15 Scene Modes and Magic Filters such as Pop Art, Pin Hole, Fisheye, Drawing, Soft Focus, Punk, Sparkle, Water Color and Reflection. It also features digital image stabilisation and a Beauty mode, where an individual's skin can be smoothed, brightened, make up effects can be added and teeth can be whitened.